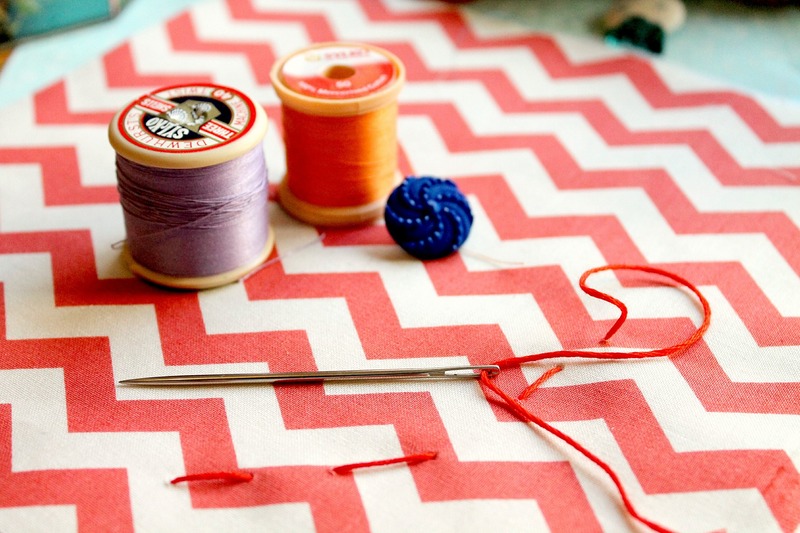 If you’re anything like me, then you’ll have a deep appreciation for all things homemade. Making something by hand doesn’t mean it has to be awkward, shapeless or unfinished. If you’re going to put in all that time and effort, you deserve to be proud of the result, so today I thought I’d explore how to give your homemade clothes a professional finish. I’m sharing my top tips for avoiding those common ‘tell-tale’ signs that something is home-sewn. 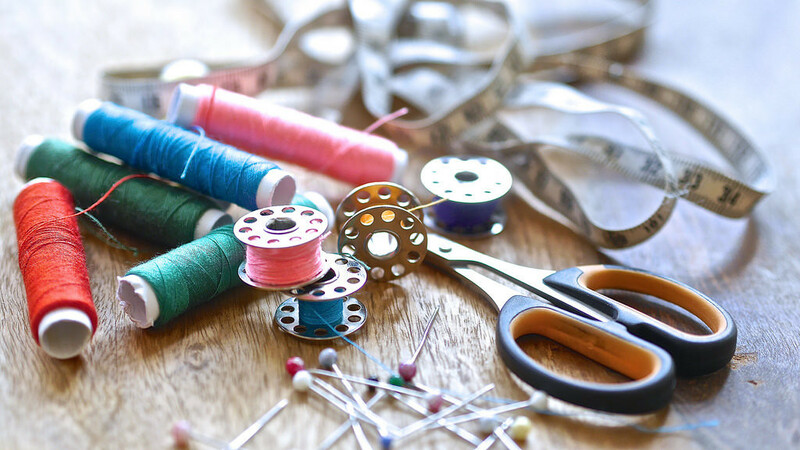 While you might be sewing homemade clothing to save money, that doesn’t mean you have to choose cheap-looking fabrics. Tasia St. Germaine from Sewaholic recommends choosing a nice looking polyester or rayon, which mimics silk but is far more affordable. I’d prefer to choose a quality fabric personally – avoiding shiny fabrics or overly busy patterns that tend to look cheap. Instead, seek out rich-looking textures, hand woven textiles and natural fibres like organic cotton, silk and wool. Once you’ve chosen the perfect fabric, don’t go hacking away at it. You’ll want to do some prep work before you even pick up those scissors. Wash your fabric and iron it. Then, mark your pattern. In her fabulous Design Diary, Megan Nielsen insists you pay particular attention to the grain of the fabric – and I completely agree! Your clothing will fall and drape much better if your pattern lines run parallel to the natural grain of the fabric. I’m meticulous about the grain – I even use a ruler to check that I’m completely parallel. When you are ready to cut, do so carefully and precisely. One of those unfriendly ‘tell-tale’ signs of homemade clothing is an unflattering fit. As Katrina Kay notes, DIY sewers have an unfortunate tendency to follow the pattern rigidly without taking the wearer into account. No one wants a shapeless top or dress. 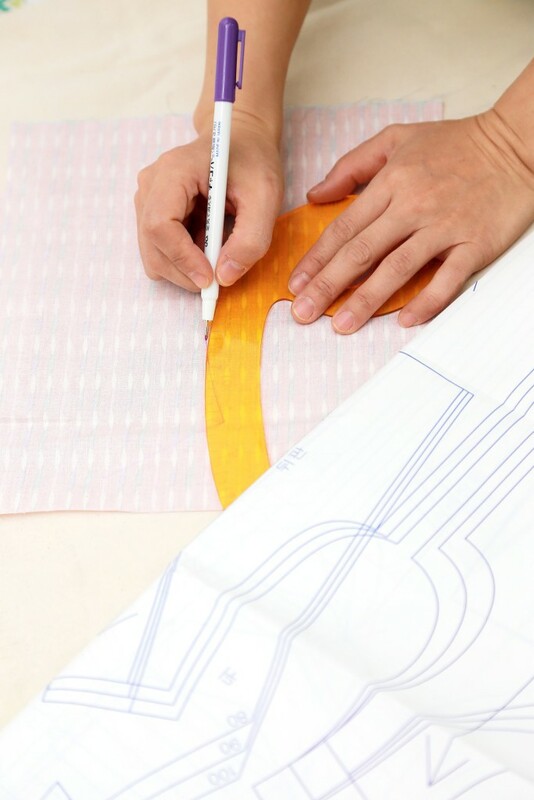 Cut out a test pattern with inexpensive muslin material, and fit this to your form. This will tell you exactly where you need to alter the pattern when you start on the final fabric. Though your grandmother’s dull shears might be nostalgic, they can absolutely ruin fabric with inaccurate cuts and blunt stretching. Take the time to sharpen those scissors or get a new pair. Also, be sure you are using the appropriate marking material and needles. Using the wrong needle can lead to unwanted snags or tears. And don’t forget to choose the right thread in a color that blends in appropriately. At one time or another, every sewer has been tempted to leave inner seams alone. After all, no one else if going to see them. They don’t seem like that big of a deal… until they start to tangle or unravel. Beth Wilson of Sew Mama Sew says that your handmade clothing “should look as good on the inside as it does on the outside.” And she’s right! 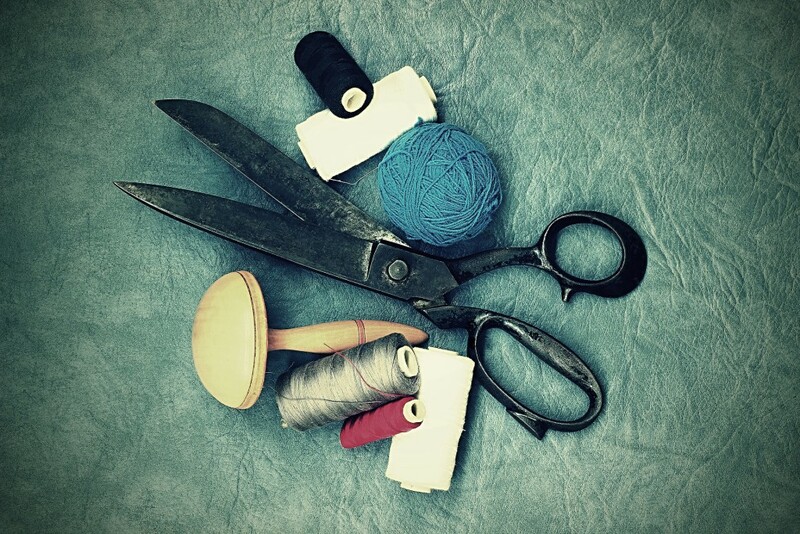 You want to enjoy your clothing, not spend an eternity snipping loose strings or mending holes. Taking care of the inside of your clothes will also mean they last longer. While we’re on the topic, let’s talk French seams. Some types of fabric just beg for French seams, namely thin and delicate materials like chiffon. Because chiffon tends to be rather sheer, the inner seams are often visible. French seams are perfect because they create a neat and uniform finish that encloses the not-so-neat seam allowances left behind. 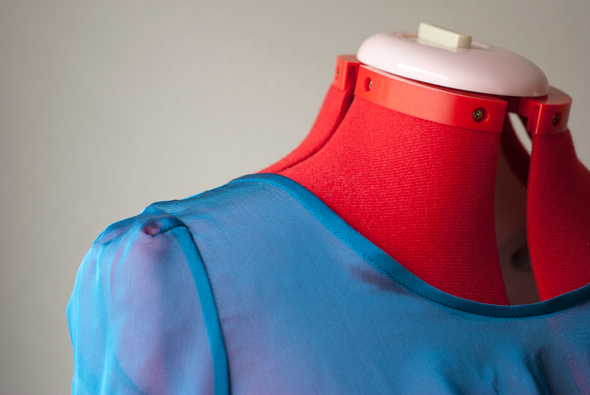 Here are some more tips for sewing chiffon! To avoid frumpy necklines, Lisa Mabey insists that you always apply stay stitching. These subtle stitches stay inside the clothing to structure curved edges. Thus encouraging necklines and other curves to maintain their intended shape. Though seemingly unessential, they are priceless when it comes to preventing sagging or stretching as you sew. A tailoring lecturer of mine once said that the secret to beautiful tailoring is 10% sewing and 90% ironing. Few people love to iron, but it’s a necessary chore, especially for those who sew their own clothes. By steam pressing your seams, you will set your stitches and help to create a stronger structure. It also smooths out lumps and puffing in your hems. As a result, handmade clothing instantly looks sharper and more professional. If there is one area where you shouldn’t scrimp, it’s elastics. Thin, small elastic casings instantly cheapen the look of homemade clothes. Choose wider elastic for a more professional finish. Also, be sure to make the casings snug to prevent unsightly twisting. Yuk! One final tip: Take your time and do a good job. Don’t rush through the process, or else your finished product will probably look hurried as well. I always spread my projects over a few hours a day. Otherwise, by the time I get to the last few seams I’m so desperate to get it finished and see what it looks like on, that I rush and mess it up at the last hurdle! Take the extra time and care to make your homemade clothes shine with perfection. Then, the next time someone asks if your outfit is homemade, you will cast away any insecurities, beam with pride, and thank them for noticing. Here at Offset Warehouse we’re always super excited to check out your handmade creations! So don’t forget to follow us on social media, and share your projects!